Life expectancy in Russia has been growing, says expert. Life expectancy in Russia has been growing, but there is a considerable gap between male and female lifespan in the country, experts said. "Male life expectancy exceeded 65 years two years ago, for the first time in Russia's history. 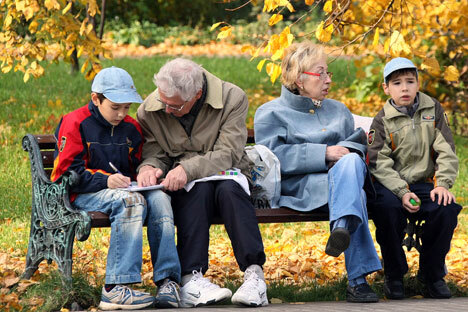 However, the gap between male and female lifespan exceeds 11 years," laboratory head at the Russian Academy of Sciences' Occupational Medicine Research Institute, Russian State Social University's Social Statistics and Demography Department Professor Galina Tikhonova told the press on June 1. "The gap exists in all developed countries, but a gap this big is characteristic of our state," she said. Male lifespan in Russia is 15 years shorter than in developed countries and nine years shorter than in China, although male lifespan in China was shorter than in Russia a short time ago, she said. "The mortality rate has really been declining, but we should mind the reference point: the mortality rate was highest in 1995 as a result of the reforms. Now the rate is being compared to the 1995 level, when the mortality rate was highest. Indeed, it is declining compared to that point, but we have yet to regain the 1990 level," Tikhonova said. The mortality rate amongst able-bodied Russians is thrice or four-fold higher than it is in developed nations, she said.